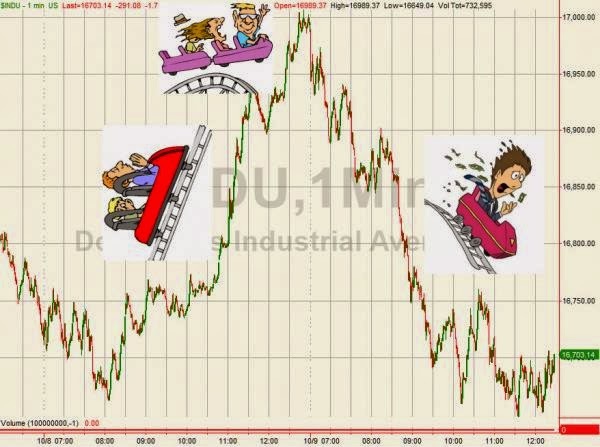 Yesterday's panic buying vertical ramp in stocks - decoupling from everything but the trusty partners VIX and AUDJPY - has been entirely unwound as The Dow drops over 300 points (nearly unchanged for 2014), Trannies tumble and Small Caps slump. Stocks all closed significantly lower - despite a late-day effort to lift - ending the day down from pre-FOMC Minutes. Treasuries closed 0-2bps higher in yield but had ignored equity exuberance and provided the reality check by the close. Real trading volatility ranges are surging in the major indices which historically has not been a good sign. The USD retarced some of the FOMC losses as Draghi chatter pushed EUR higher. Oil prices cratered under $85 as gold and silver rose (despite USD strength). Following yesterday's biggest intrday swing since Nov 2011, the Russell 2000 saw its worst day in 6 months. Today was the 4th most active (in terms of quotes/trades) ever. Even Bob Pisani knows by now that the European Close seems to create a trend-reversal moment intraday that few machines (and even fewer humans) are willing to fight. Whether this is remnants of short-term cycles found due to POMO or just a drop in liquidity is unclear; but what is clear, it happens, and all too regularly... except today. After a notably weak start to the day, the machines were just getting revved up for the 1130ET reversal to kick in and lift the market back to VWAP when a curious thing happened... "someone" canceled-and-replaced orders for 666 contracts 26 times in the 1130ET to 1200ET period... and selling accelerated lower, no reversal, to close at the lows on heavy volume.